"Lecher Alphornbläser" - Trachtenkapelle Lech - mehr geht nicht! 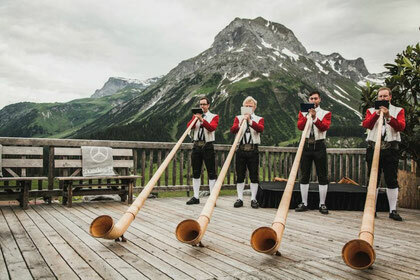 In former times, the giant wooden alphorn was used for signalling and communicating across the valleys in Alpine regions. These days this sonorous instrument is a highlight at the summer outdoor concerts. As an ensemble the "Lech Alphorn Players" was established in 1981. Four Lech hoteliers, namely, the then Mayor Komm.Rat Johann Schneider (Hotel Arlberg), his brother Gebhard Schneider (Hotel Almhof), Hilde Skardarasy (Hotel Zürserhof), as well as the the bandchairman Peter Burger (Hotel Berghof) donated four alphorns to the band. In subsequent years this group has developed into a well-known ensemble, beyond Lech as well. The players perform regularly during the band`s summer outdoor concerts and also independently at various festivities creating a unique atmosphere. In 2004, after 23 years of strenuous practices and concerts, the already declining ensemble was ready to slide into a well-deserved retirement. The exceedingly generous purchase of four new alphorns by four local hoteliers facilitated the revitalisaion of the ensemble. In alphabetic order the sponsors were: Past-chairman Peter Burger (Hotel Berghof), Gerhard Lucian (Burghotel), Komm.Rat Johann Schneider (Hotel Arlberg) and Willi Skardarasy (Hotel Zürserhof). A heartfelt "thankyou" to you all. Whoever has the pleasure of hearing these "natural tone virtuosos" are enthralled with the deep, rich, resonant sound of this woodwind instrument.